Women are just wonderful creatures aren't they? They care for you. They bring you food. They're pretty to look at. And they defend the planet from unruly Gods with their magical powers. Yeah! It's true. I saw it in this lovely looking animated film made in 2009 that lasted for 74-minutes. Or else I ate too much cheese before I went to sleep last night. Hmm? Being an Amazonian isn't very easy you know. You have to wear a bra made out of metal. You have to look good in a thong made out of a flag. Plus you have to help out your Mother whenever the need arises too. Yeah. Take Queen Hippolyta's daughter, Princess Diana, for instance. Honest to God, all she thought she had to do was beat the living cr*p out of her fellow Amazonian sisters, so she could then be given the privilege to take the randy-crashed-pilot, Steve Trevor, back to 'mans world' again. But no. Her mother's one time lover -- Ares, the God of War -- breaks out of his confinement on Paradise Island once this contest is over and done with. So now she has to track him down as well. Still, it could be a lot worse I suppose. Diana could be sitting in a bar somewhere in New York City with Captain Steve; with him plying her drinks so he can get to know her better, WINK-WINK! Moreover, she could lose a fight with Ares once she claps her eyes on him; inadvertently paving the way for this un-God-like figure to power up with a bit of help from his b*stard of an Uncle, BOOM! Yes. I'm afraid to say that this is one of those adventures, dear reader. One where poor pretty Diana has to travel from 'Supermodel World' to 'Idiots Burg', with the intent of dazzling all in sundry so she can defend the world from truth, justice, and a religious zealot who want to destroy the world and then transform it into his own image. But then again, that's most probably why what next transpires begins when Diana and Steve air a few home truths. As zombie's rise - a pilot fly's - a demon falls - and the ways of men best get ready for a good old fashioned kick in the balls. 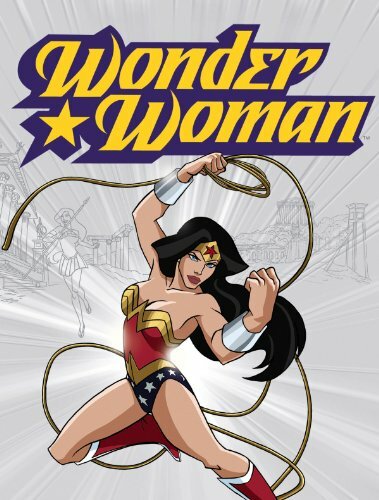 Now to be blatantly honest with you, I only have three small gripes with this great-great 'Wonder Woman' cartoon. Firstly, I wasn't too keen on the cheesy chest shot of Diana getting into her bodice -- because it felt slightly exploitative to me. Secondly, the initial battle between Steve and Diana appeared very illogical on the surface -- as she could have smashed him to bits in a single punch. And thirdly, why-oh-why-oh-why must all of the Amazonians have American accents, when it clearly stated at the beginning of this piece that they were all Greco-Roman in origin. However, apart from that -- nish -- this cartoon was wonderful. No. Better than wonderful. It was brutal, nicely composed, funny in places, and had a real focused attitude where character development was concerted. For example: (1) The majority of the battle scenes just had that clean and shocking veal in execution, and they really took me out of my seat when the limbs started to fly. (2) The numerous scenes where Steve Trevor tries to 'hit on' Diana were just a blast to watch. Honestly, laugh out loud funny to a factor of eleven. (3) There are segments scattered though out this cartoon that illustrated growth and understanding between the characters. Now personally speaking, this elevated this good story to a fantastic story. (4) I loved the cameos in this toon -- like the Cheetah one for instance -- plus I would have loved to have seen a few more. (5) The hyped up feeling of dread at the beginning and the end of flick was just great in my eyes. Heck, nearing its conclusion I was hoping for the Justice League to show up to save the day -- it was that menacing. Hey! While I'm in a bullet-point sort of a mood, let's have some filmic facts now, shall we? (1) The world's premiere of this animated movie was at the New York Comic-Con on the 6th of February, 2009. (2) This direct to DVD production made $6,898,033 at the box office. (3) Casting director, Andrea Romano, cast Keri Russell in the role of Wonder Woman partly based on her performance in the film 'Waitress'. (4) TV's Wonder Woman, Lynda Carter, turned down the opportunity to voice the Goddess, Hera, because of a scheduling conflict. (5) Originally this story was going to be about the Greek God, Ares, escaping from Paradise Island and starting World War III with 'The Hand of Rage'. However, during subsequent discussions, this story-line was eventually dropped and replaced with the one presented. (6) Conceptually this movie was based on the first story-line of the second ongoing 'Wonder Woman' comic book series that was published in 1987. It was called "Gods and Mortals", and was devised by George Perez, Len Wein, and Greg Potter. (7) According to the official MySpace page, Wonder Woman is 25 years of age and her star sign is Pisces. (8) In the comic book's, Etta Candy is a portly military officer who quickly becomes a good friend of Diana's. Not like this version at all. (9) On its release, Rotten Tomatoes gave this flick an 86% score based on seven reviews. Do I have to say any more than that, folks? No. I don't think so either. Overall 'Wonder Woman' was just a superb cartoon. It was pleasing to the heart. Good for the soul. Plus had a rather refreshing jovial ring to it that I was really happy to watch. Wouldn't you agree, you wonderful woman you? She said 'Yes'. I saw it in her chest wobble.